Great news: The ‘Berkova’ Guadagnini just passed a checkup at the doctor’s office. 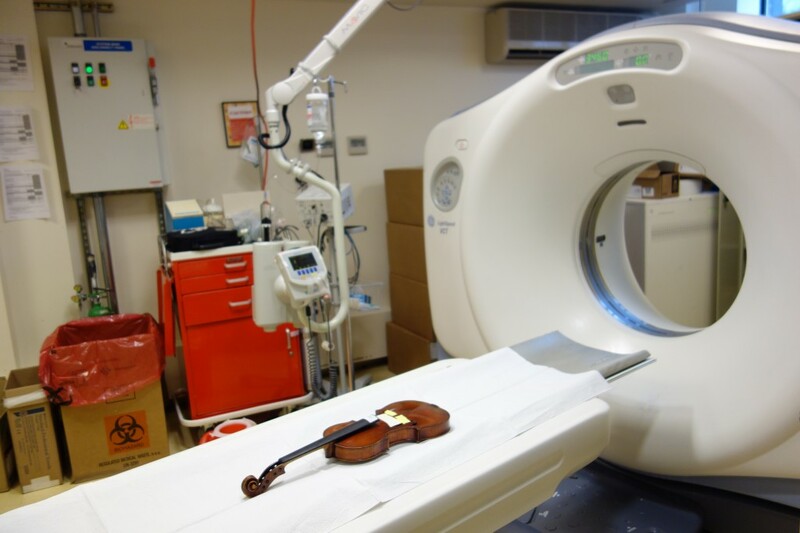 To investigate the extent of the worm repair to the lower back corner Tarisio took the violin for a CT scan at the New York Medical Imaging facility on 84th Street in New York. CT scans are extremely effective in analyzing condition and structural integrity and produce an image similar to an x-ray of the instrument. In the past it was much more difficult to diagnose the extent of woodworm damage. Now we have technology to tell us when it’s only a minor issue. The scan of the ‘Berkova’ showed that the worm restoration was very minor and limited to the lower treble corner. The central section of the back was completely clean and healthy. Our most sincere thanks to Dr. Anthony Vine and his colleagues at NYMI Associates, including Drs. Burt Cohen and Joe Maklansky and CT tech Danny Rosen for allowing us to use the facility and for handling our “patient” with such care.